Annual Data Scaled geometric mean of young-of-year striped bass in the primary nursery areas of Virginia (index stations) by year. Vertical bars are ±2 standard errors of the mean. Horizontal lines indicate the historical arithmetic mean (solid) and confidence intervals (dotted) for 1967-2013. Graph courtesy of Dr. Mary Fabrizio. Seine Net Bruce Pfirrmann and Anya Voloshin deploy a seine net on the Rappahannock River during the 2013 Juvenile Striped Bass Seine Survey. Photo by Christopher Davis. Seining Bruce Pfirrmann and Anya Voloshin deploy a seine net on the Rappahannock River during the 2013 Juvenile Striped Bass Seine Survey. Photo by Christopher Davis. Preliminary results from a long-term monitoring program conducted by researchers at the Virginia Institute of Marine Science (VIMS) suggests an average number of young-of-year striped bass was produced in Virginia tributaries of Chesapeake Bay in 2013. The 2013 year class represents the group of fish hatched this spring, which could grow to fishable sizes in three to four years. The monitoring program, formally known as the Juvenile Striped Bass Seine Survey, recorded more than 10 fish per seine haul, which is roughly equivalent to the historic average of 9 fish per seine haul. This is a considerable increase in annual recruitment from last year when recruitment of juvenile striped bass throughout Chesapeake Bay was among the lowest ever observed. The improvement in recruitment observed in 2013 is consistent with historically observed patterns in which striped bass populations, and the fisheries they support, are stabilized by strong year classes that can mitigate the effect of less productive years. For example, increased recruitment in 2013, 2003, and 2000 followed years of below-average recruitment in 2012, 2002, and 1999. The return of the juvenile abundance index to average levels in 2013 suggests that striped bass abundance may appear less variable once this cohort joins the adult population. Striped bass spawning biomass—a measure of the adult fish that return to spawn each spring—is traditionally dominated by a few strong year classes. For instance, striped bass recovery in the early 1990s was partially attributed to a few strong year classes produced in the late 1980s. Therefore, a single poor year of recruitment such as that observed in 2012 can be partially offset by production in previous or subsequent years. Although the 2013 year class of striped bass is considered average in terms of abundance, it represents a significant increase following the low recruitment observed in 2012. Striped bass play an important role as a top predator in the Chesapeake Bay ecosystem and provide value to numerous commercial and recreational anglers. Professor Mary Fabrizio, who directs the Juvenile Striped Bass Seine Survey at VIMS, notes that the economic and ecological value of striped bass lends significant interest to the year-to-year status of their population. By estimating the relative number of young-of-year striped bass, the Juvenile Striped Bass Seine Survey provides an important measure of annual and long-term trends in the Bay's striped bass population. The VIMS Juvenile Striped Bass Seine Survey currently samples 18 stations in the Rappahannock, York, and James River watersheds. Each year, biologists sample each site 5 times from early July through mid-September, deploying a 100-foot-long seine net from the shore. They count each netted fish, measure its length, and return it to the water. 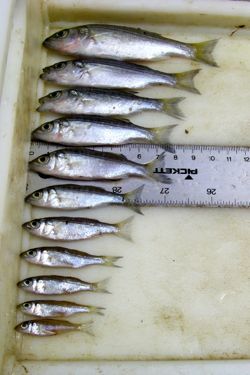 These young striped bass generally measure between 40 and 100 mm (1.5-4 inches). Survey scientists in Virginia measured 1,615 juvenile striped bass at these stations in 2013. VIMS has been conducting the survey annually since 1967 for the Virginia Marine Resources Commission. 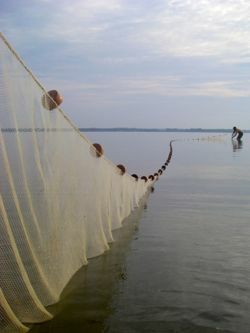 Information about a similar survey conducted by the Maryland Department of Natural Resources for striped bass populations in the Maryland portion of Chesapeake Bay can be found at http://dnr.maryland.gov/fisheries/juvindex.